More robots on the way for factories? While there has been some concern among workers about the ways in which automation would affect them, some industry experts believe that there's little to be worried about. Indeed, as more companies integrate robots into their existing operations without cutting hiring thanks to growing demand, many of those initial reservations are already starting to melt away. 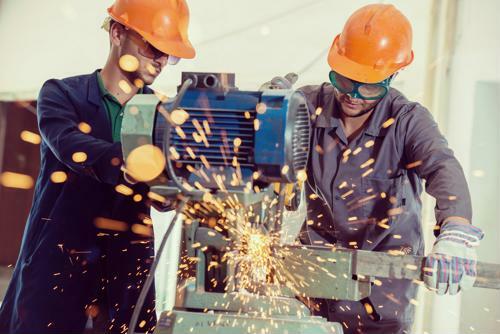 Today, about 3 in every 4 manufacturing workers say they're not worried about their job security, even as 1 in 3 believe robotics and artificial intelligence are currently making their jobs a little more difficult, according to a new survey from Nintex. Almost two-thirds of those polled said they were broadly aware of the how the industry was changing, but fewer than 1 in 4 said they were involved in those changes. Interestingly, though, it seems as if workers want to get extra familiarity with how this trend is moving, as almost three-quarters of respondents said they want more involvement, the survey found. That's due, in part, to the fact that 98 percent of manufacturing professionals polled believe the job requires skills that take years to acquire. Currently, fewer than 1 in 3 manufacturing companies in the survey say they have instituted some sort of plan for a "digital transformation" any time soon, and only 15 percent believe they will see job losses as a result of increasing automation, the report said. In fact, one of the big reasons why factory workers might feel so confident in their jobs is because of just how strong their industry has grown in recent years, according to Jay Timmons, president and CEO of the National Association of Manufacturers, giving his annual State of Manufacturing Address in Michigan earlier this year. The fact is that the manufacturing skills gap is already so great - now pushing closer to 400,000 unfilled jobs nationwide and expected to grow into the 2 million range in the next several years - that any automation adoption will be used to offset those concerns first and foremost. "We've seen, for example, how automakers use technologies like augmented reality to test new assembly methods and improve ergonomics for their workers, improving both health and efficiency," Timmons said. "Automation means jobs. Here in Oakland County (Michigan), home of Automation Alley, you've added more than 19,000 manufacturing jobs since the Great Recession. That's growth of more than 40 percent." However, Timmons did note that while automation isn't taking jobs away by any stretch, it is changing some of the types of jobs manufacturers create, and that's something to which all in the industry must adapt. It's believed that, worldwide, production companies are likely to create some $22 billion in annual revenues for commercial robots in manufacturing settings by 2027, according to Quality Magazine. That's up from the projected $166 million for this year. When manufacturing companies need to fill jobs and investing in robots isn't in the cards quite yet, it's vital that they ensure their salary and benefits offerings are more than just competitive with other firms in their market. Being able to both attract and retain top talent is vital to long-term success.